Nestled between a bar and a Cricket store. Considering the long night and my lack of groceries in the fridge, today was looking perfect for brunch out. 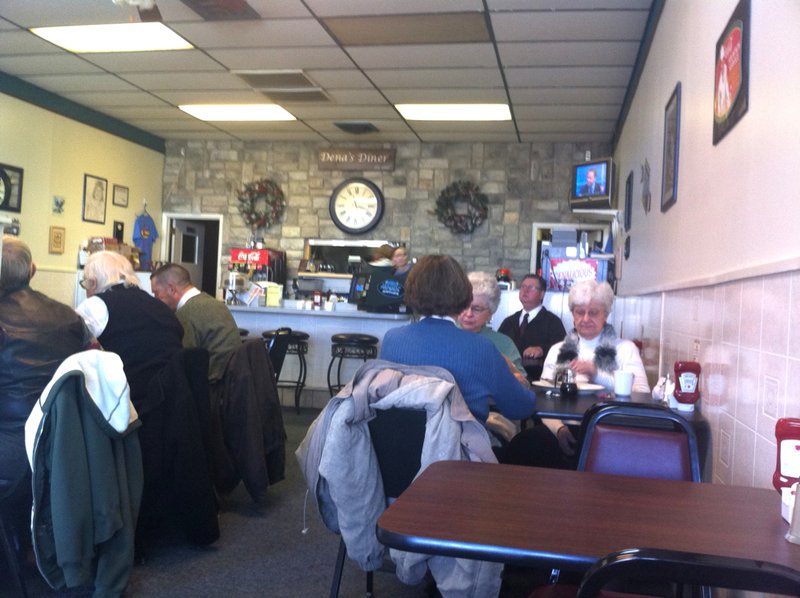 We recently moved to Colerain, and have been eyeing the little diner down the road for weeks now, so we decided to visit. We scrambled into the car, turned up the heat, and made the quick drive to Dena’s. It is at the almost-abandoned end of the Super Walmart plaza and very easy to miss. We found a nearby parking spot and made our way inside. The six-page menu covered all meals, and seemed like pretty standard fare for such a place: breakfast, sandwiches, burgers and simple dinner entrees. We ordered drinks and asked for the waitresses recommendations for breakfast. I took her advice and tried a breakfast burrito and a pancake. My partner had her standard: french toast, eggs, bacon and homefries.I expected the typical greasy spoon look: quaint and greasy. I was surprised instead to find a small dining room that was simple and very clean. We took a seat by the window and waited a few seconds for the waitress to arrive with menus and a drink order. 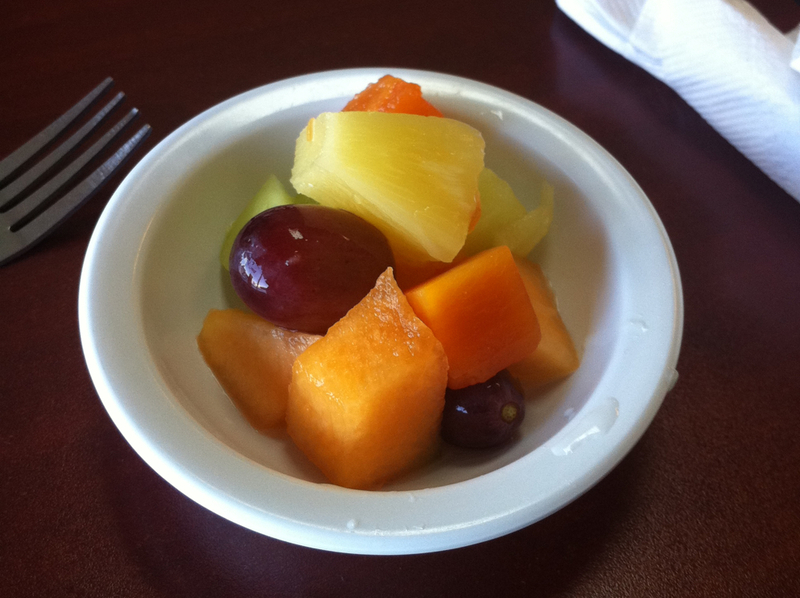 Our drinks quickly arrived, along with another surprise: fresh fruit cup, apparently standard with each breakfast there. Although the “fresh” fruit was actually canned (with the exception of the musk melon), I was still impressed that this was given to us at all. Our food came several minutes later. The first thing I noticed was the burrito: it was actually a quesadilla! 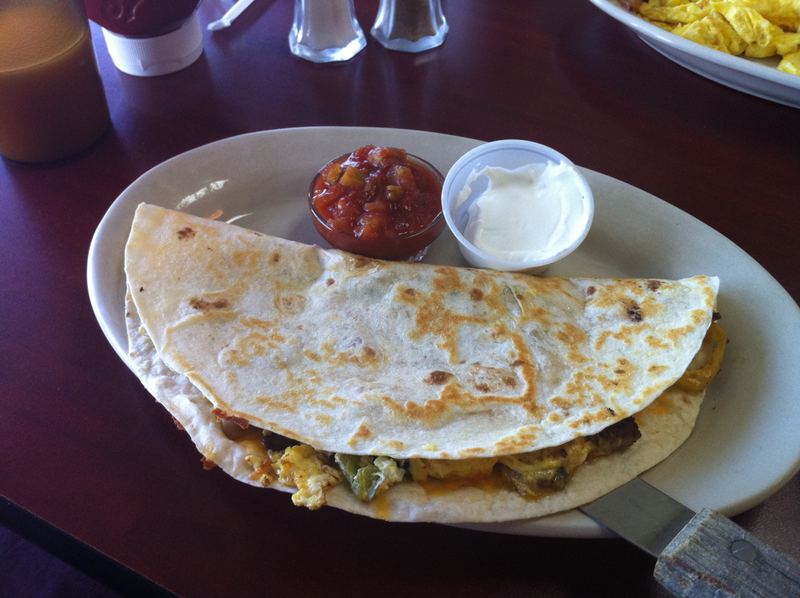 The “burrito” itself was good, filled with fresh-cooked eggs, cheese, sausage, and a smattering of fresh and canned vegetables. The banana peppers gave it a nice bit. Condiments included salsa (Pace Picante) and sour cream. Nothing amazing, but solid, and well worth the $5.25. 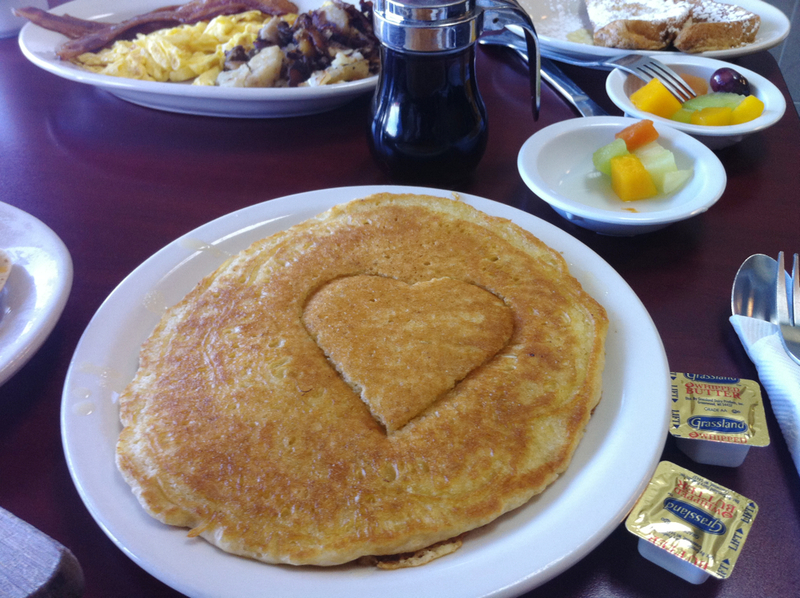 The pancake was moist and perfectly cooked, with a heart-shaped cutout. There was a very, very slight aftertaste, but I don’t think it came from a box. Overall decent, but nothing I would order again. The nicest touch was the butter. 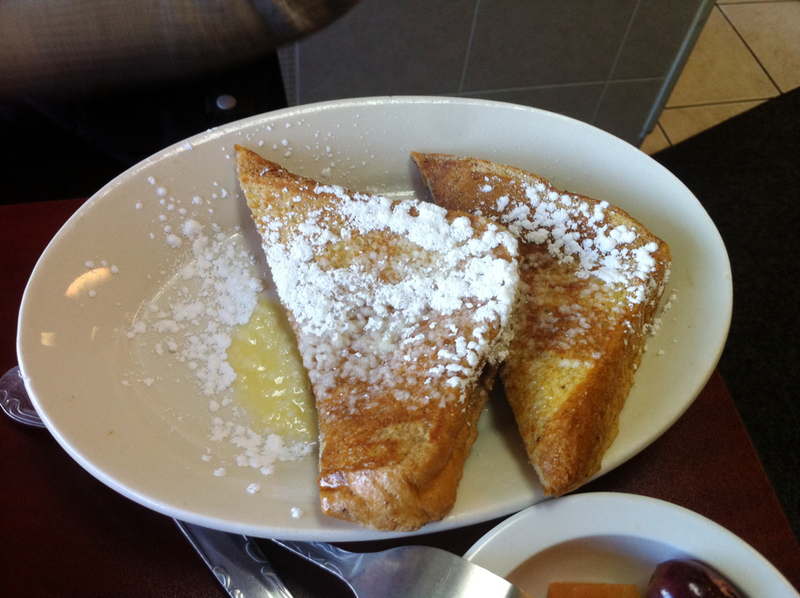 Most restaurants provide trans-fat-filled margarine, or rock-solid butter straight from the fridge. Dena’s came with butter already melted onto the pancake, and with extra (softened) on side. Nice! My partner’s French toast was a bit better. It was dipped in melted vanilla bean ice cream, and fried perfectly, moist on the inside with a crunch on the sides. Like the pancake, it also had butter pre-melted on top, and a dusting of confectioner’s sugar. This I would eat again. 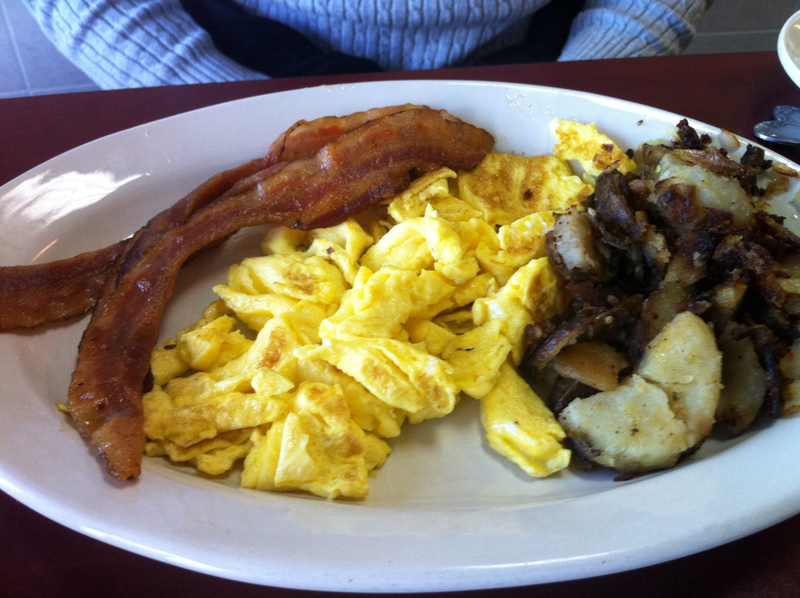 The rest of her food was passable, standard, greasy American breakfast fare. All items came cooked on the griddle, most likely at the same time (as they seemed to share each other’s flavors a bit). As you can see from the picture below, it wasn’t exactly pretty, but it hit the spot for a quick Sunday brunch. 2 Eggs with Side of Bacon, $5.50. I should mention the waitstaff was very courteous and professional. The two waitresses took turns waiting on us, and it seemed the very second we ran out of drinks or needed something they would be there ready to help. 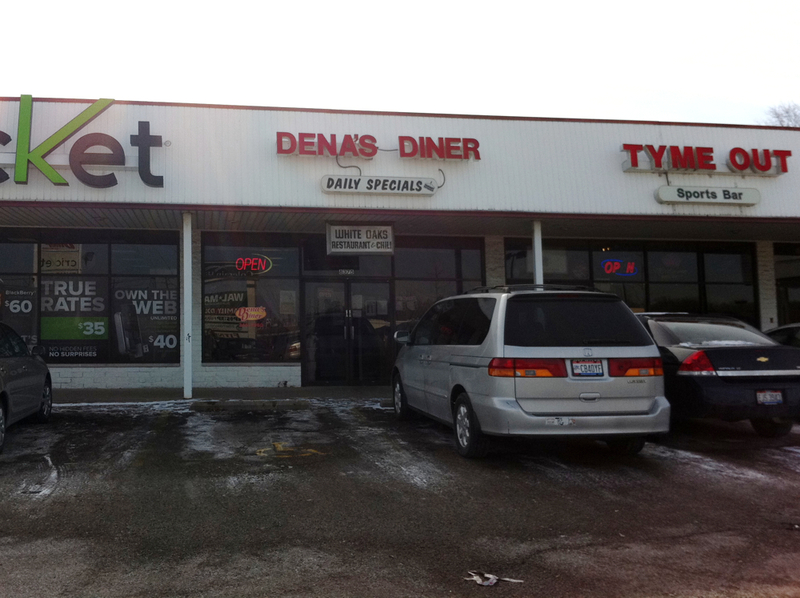 Dena’s is also known for its double deckers, burgers and desserts. The meal wasn’t perfect, but it was certainly better than the majority of greasy spoons I’ve visited. I’ll have to make another trip soon to sample the rest. In the meantime it can’t be beat for convenience when I am groggy, hungry and lazy in the morning. Amateur chef and foodie, traveling the city for obscure food spots and making occasional recipes and rants on Weston A. Price and whole foods.